A long time ago, in a high school far FAR away… Your intrepid writer Jim struggled with his sexuality. I don’t really think a 14 year old even understands what “sexual orientation” really is, but at the time, it was literally the only thing I cared about/thought about. Here’s an example: for a whole solid semester, I went through this phase where I was asexual. I was like NOPE to love. NUH-UH to being gay/straight, whatever I was. I don’t even think I really knew was asexuality was. But I’m a hopeless romantic. By college I was finally 100% sure I was the gayest I could possibly be, and I started dating guys in earnest. Then I met THE guy. And my story continues, happily ever after. 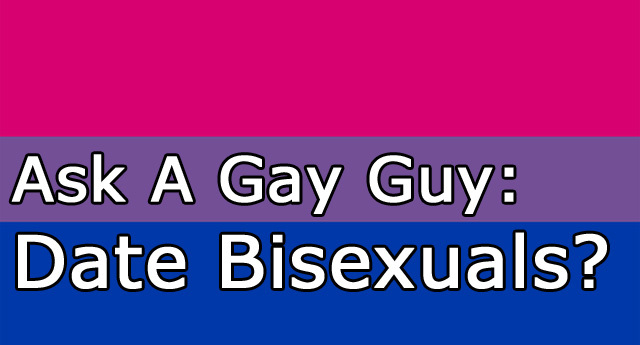 So back to the point of this post – I overheard this conversation among some acquaintances about how one of them was currently dating a guy who identified as bi-sexual… And he was expressing some “concerns”. I couldn’t really relate… I feel like when I was dating guys, they were either “gay” or “straight”… There were no in betweens. So I went and asked a couple of friends of mine to answer some questions for me regarding what’s become a great debate: Is dating a bi-guy a good idea? What’s the difference? I’m one of the lucky guys, and have been with my partner for almost 10 years… We’re both gay and proud, and neither of us has dated another guy who was “openly” bi. I found two of my friends who have… And naturally I assaulted them with questions for this post. Since I’m obviously not going to use their real names, we’ll call them Friend 1, and Friend 2. I know, very creative. 1. Have you ever dated a bisexual guy? 2. Based on that experience, would you again? 3. What are some of the main differences between the relationships you’ve had with gay men and bisexual men? 4. What turns you on about bi-sexual men? 5. What steers you away from dating bi-sexual men? 6. What would be your main concern about dating a man who identifies as bi-sexual? 7. What did you learn about yourself while dating a bi-sexual man? 8. What did you learn about the bisexual community while dating a bi-sexual man? 9. Do you believe that those who identify as bisexual are predisposed to infidelity? 10. The inability to choose a gender-specific sexual orientation indicates a potentially larger, deep-rooted issue. Is this person indecisive? Unable to commit? If a man can’t commit to a sexually based gender role, how can I expect him to commit to me? This entry was posted in Dating and Relationships and tagged advice, bisexual, bisexuals, date, dating, relationships, tips by Jim. Bookmark the permalink.